If you have a student in the family they will be packing or heading off to Uni' this week. We have some top tax tips and an adviser guide. Late filing penalty appeals for non-residents who missed the 2015 change in the UK's CGT law have taken up a lot more of my time this week. We have now reviewed all the published appeals and created a useful table which highlights the key features of each judgment. You will be pleased to see that it's on freeview. I note that few people seem to be appealing the amount of the late filing penalty as it appears to me that HMRC have not programmed in part of Schedule 55 FA 2009 correctly and so the computer is overcharging some people. This is not confined to just NRCGT. We have a guide to this in our Penalties: Grounds for Appeal Toolkit. More software is appearing on the list of Making VAT Digital (MVD) Functional Compatible software and the MVD trial is still only looking at very basic cases. Perhaps the Chancellor should make every VAT registered business a tax free cash award to compensate us for the extra cost of MVD. Still on software, don't overlook the Self Assessment exclusions list, especially if you are a Scottish taxpayer. Whilst I appreciate that Scotland might like independence did anyone factor in the tax complexities and associated costs of having multiple rates and allowances? 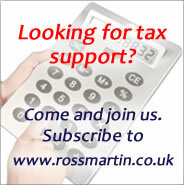 If you have any tax queries please do try out our Virtual Tax Partner support portal at www.VtaxP.co.uk: subscribers you are entitled to free quick queries so do ask. Once again there are many instances where taxpayers cannot file online as HMRC is unable to provide software specification. Its not looking good if you are a Scottish taxpayer. Following the Bank of England’s decision to increase the base rate, HMRC have announced that their late payment interest rate will increase by 0.25% to 3.25% with effect from 21 August 2018. Finance Bill 2019 includes proposals which enable employers to pay certain subsistence expenses without needing to check or retain employee's receipts. Finance Bill 2019 includes proposals which will reduce the deadline for paying SDLT and filing the SDLT return from 30 days to 14 days. UPDATE: things are not quite as bad as they seem: if you use a tax agent. There are no special tax rules for students, although there are a few pitfalls to watch out for. UPDATE: a practical guide that looks at the key compliance and tax planning issues for non-UK residents. UPDATE: The CIOT and ATT have now published guidance on this. We have reviewed this and updated our guide for you. UPDATE: more info on 36 month rule for disabled taxpayers and taxpayers moving into care. UPDATE: for proposed changes in Finance Bill 2019 re beneift in kind exemption for premiums. NEW: at a glance all the recent cases on late filing penalties and the mixed results of the appeals process. In SSE Generation Ltd v HMRC  TC06618 the First Tier tribunal (FTT) held that some of the expenditure on constructing a hydroelectric power scheme was eligible for capital allowances as plant; the rest was specifically excluded by CAA 2001. UPDATE: for changes to the 85% concession rule, transitional rules, and the new requirement to apportion directly necessary services. HMRC’s VAT Brewers’ Society Agreement terminated on 1 June 2018. HMRC have not published any formal guidance following the withdrawal. In Pertemps Limited v HMRC  TC06583, the FTT concluded that the salary sacrifice scheme operated by the taxpayer did not amount to a business so there was no supply for VAT purposes. UPDATE: more information added on distance selling and proposed new EU rules on distance selling. UPDATE: more information on digital links and bridging software.